Most popular eggs nutrition is protein, actually there are another nutrients content that can give us benefits for health. In fact, the egg should be considered as a super food because it can improve health and overcome obesity. Nutritionists say that eggs are one of the most nutrient-dense foods. Nutrient content of whole eggs contain more than 90% of calcium and iron in the egg yolk part and in one egg contains 6 grams of high quality protein and 9 essential amino acids. Egg white (chicken) contain a variety of active substances which are very efficacious to maintain, care for and provide additional nutrients to the skin pores. So for those who like to do a facial treatment is recommended to use egg white, egg white mask is also a solution for those of you who want to get rid of acne scars. Eggs contain a variety of vitamins and minerals, including vitamins A, riboflavin, folic acid, vitamin B6, vitamin B12, choline, iron, calcium, phosphorus and potassium. Chicken eggs are also the cheapest source of protein meal complete. One large chicken egg contains approximately 7 grams of protein. The content of vitamins A, D and E are in the yolk. Eggs are known to be one of the few foods that contain vitamin D. One large egg yolk contains about 60 calories and egg white contains about 15 calories. One large egg yolk contains two-thirds of the recommended daily amount of cholesterol is 300 mg. The fat in eggs is also found in egg yolk. One egg yolk also contains half the recommended daily amount of choline. Choline is a nutrient that is essential for brain development and also very important for pregnant and nursing women to ensure the development of the fetal brain. Egg prevent blood clots: Egg consumption may lower the risk of heart attack or stroke. A study published in the biological and pharmaceutical Bulletin found that the protein in the egg yolk is not only potentially inhibit blood pooling but also extend the time the conversion of fibrinogen blood protein, into fibrin yarns. Maintaining brain health: Eggs also contain choline which is vital for health. Choline is a key component of fat-containing structures in cells the membrane, which is its flexibility and integrity depend on the supply of choline. Good for pregnant women: Choline is an essential nutrient that contributes to fetal brain development and helps prevent birth defects. Two eggs provide about 250 milligrams of choline, or roughly half of the recommended daily intake for pregnant and lactating women. Maintaining stamina: Raw eggs are consumed, not only maintain hormonal balance, accelerate metabolism, and launch the circulatory system, but also maintain stamina and overall health. Curing lung disorders: In some cases, eating raw eggs were also potent cure disorders of the lungs, especially with emphysema. Healthy heart: Raw eggs are also rich in antioxidants that play a role in maintaining cardiovascular health. In the two raw eggs, two times more antioxidant content higher than one apple. Help build muscle: High protein content in eggs can make a strong body build muscle and contained. Prevent cancer and heart disease: There is an important content in the egg yolk that are beneficial to health. A study also revealed that these compounds could prevent cancer and heart disease. Eye health: The content of carotenoids in egg yolk, particularly carotenoids lutein danzeaxanthin, very beneficial for eye health. According to the researchers, this Carotenoids, which is the pigment that gives color to the yellow yolk, can lower the risk of age-related degeneration and cataracts. This substance acts as an antioxidant for the eyes, fight free radicals that can damage some parts of the retina that can affect the eye's ability to focus. Keeping weight to stay balanced: Eggs are the best source of complete protein containing all the essential amino acids for the human body. They help control the rate at which the body absorbs calories. When managing your weight, you should choose foods that provide the maximum amount of nutrients that have at least the amount of calories. Eggs are a great nutritional value for those trying to lose weight and keep the weight to stay healthy. Getting rid of acne: Eggs can be used to eliminate acne. By way of using egg white as a facial acne on the face, to treat acne that is inflamed, and make the skin softer and more toned. Eliminate dandruff: Eggs also have benefits for getting rid of dandruff. Apply an egg on the scalp, and leave for 30 minutes. Rinse with plain water, then wash up the rest of the missing eggs. Healthy hair and nails: Eggs helps the health of hair and nails from within the body due to the high sulfur contain the eggs, and various vitamins and minerals. Those who eat regularly has hair growing faster. For avoiding the occurrence of Salmonella poisoned, when the eggs will be consumed in a dirty, better not consumed in a raw state. But if the egg is not a problem in a clean condition. Another issue to consider in consuming eggs to adults, especially those aged 40 years or older, or who have a predisposition for coronary heart disease, is the cholesterol content in egg yolk. 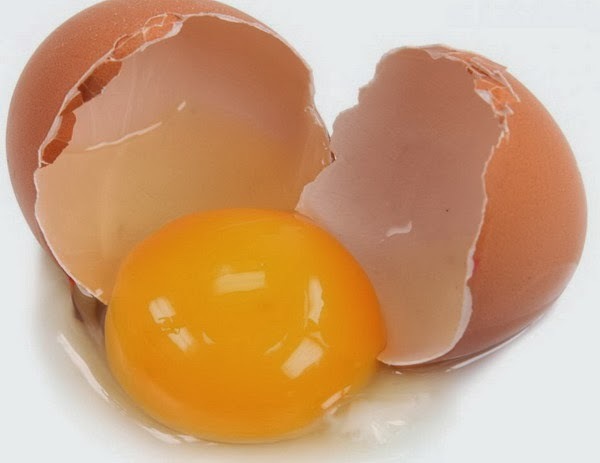 Cholesterol contained in egg yolk about 250 mg per item (in beef, there are about 75 mg per 3 ounces, inwardly approximately 370 mg / 3 ounces and in the brains of about 1700 mg / 3 ounces). Nutritionists recommend that adults consume only eggs at most 4 eggs per week.